Night at the Awards! Save the date and join us Sunday, February 24th for a live telecast of the 91st annual Celebration of Cinema and Celebrity. Dust off your formal wear and walk the Red Carpet at the Lincoln's Night at the Awards. Enjoy specialty cocktails, photo booth, awards bingo, and more as we enjoy the show together. 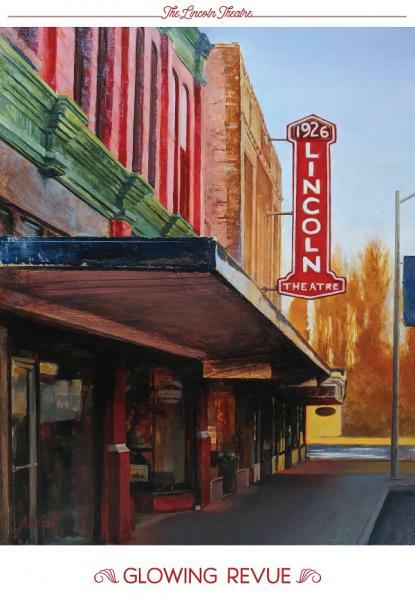 This event is FREE to Lincoln Theatre Members and only $15 for non-members. Become a Member and get in Free! Individual Level Members receive one free ticket; Supporter Level Members receive up to 4 tickets per household. GRAND PRIZE - An ANNUAL FILM PASS to the patron who most accurately predicts the Award Winners. Prep for the night by pre-filling your Awards Ballot. Ballots are available HERE. Artist Jennifer McGill will be in attendance signing her limited edition print of Glowing Review. Become a VIP and get rewarded with specialty seating during the event and a Red Carpet Reception before the doors open to the general public. Reception include hors d'oeuvres, beverages, a swag bag and music from the Joel Erickson Jazz Band. Member VIP $30; non-member $45. More information and surprises in store – stay tuned! Get ready for the show with a visit to House of Style in downtown Mount Vernon! Mention the Night at the Awards and receive a 25% discount on a dress for the evening!